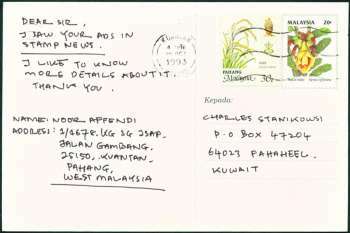 Joint publish between Pos Malaysia & TV3 (Malaysia's private tv station) of 10 different postcards on 9 October 1993. Each one has a value of 20 sen.
Dimension: 25 x 33 mm. Uprated with a 30 sen stamp from Pahang (a state in Malaysia).